Do spring rain showers cause excess water under your home? Have you ever experienced a nasty water leak? Busted pipes and poor drainage systems can leave your basement in a mess. Thankfully, there’s a solution—waterproofing your basement! Flood prevention is possible. In four simple steps, we’re going to tell you how you can waterproof the basement of your Northern Colorado home—and when the best time to take action will be. Step 1: Add dirt near your home’s foundation. Step 2: Clean your gutters. Draining rainwater away from your home is ideal to keep basements and foundations damage-free. Excess water can and will damage your roof, walls, foundation, and landscaping—so to avoid this, it’s best to clean your gutters regularly. Clean your gutters on a regular schedule—it’s recommended two times per year—to ensure proper drainage. If your home does not have gutters installed already, consider installing some yourself, or hiring a contractor to do so. Proper gutters ensure that water is diverted away from your home—and helps your foundation avoid water damage over time. Step 3: Avoid planting too close to your foundation. Everyone loves a beautiful landscape, but planting too close to the home can cause trouble in paradise. Flowers, shrubs, and bushes planted within 12-inches of your foundation can create a path for surface water to make its way into your basement. Do you have plants already planted in this area? If so, it’s best to remove these and cut through as many roots as possible. Step 4: Control the condensation and humidity in your basement. Waterproofing your basement isn’t just an outside issue. Humidity and condensation can also be a major player in the fight for keeping your basement water-free (and can lead to mold growth if not attended to now!). To control condensation, you can do one of two things: (1) install foam insulation around your pipes or (2) install new wall insulation. New pipe and wall insulation can also help you avoid bursting pipes due to freezing winter temperatures. To control humidity levels in your basement, consider investing in a dehumidifier as a low-cost solution. 970 Services offers the best in roofing and restoration services to our Northern Colorado customers. Located in Loveland, we resolve damage caused by hail, wind, water, fire, mold, smoke, and soot. 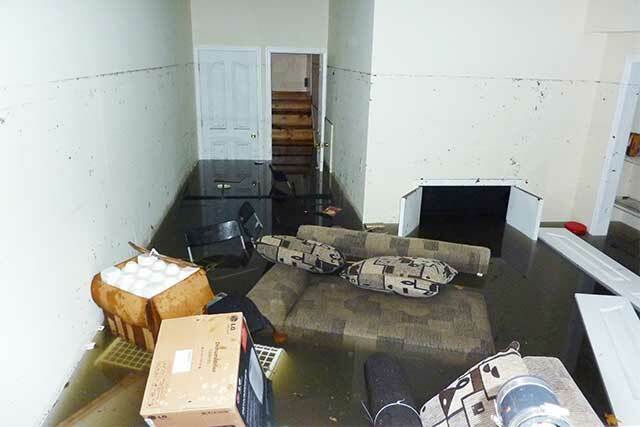 Our experts can assess any water damage and walk you through a plan for restoration in no time. When you hire us, you should feel confident—970 Services is always prepared to tackle any home restoration project, roof repair, or roof replacement and get your home back to normal. Call us today or contact us online for a free estimate—(970) 888-0970. Located in Loveland, CO, we also offer roof repair, roof replacement, and home restoration service in the following areas: Fort Collins, Loveland, Ault, Greeley, Denver, Windsor, Boulder, Longmont, and throughout Northern Colorado.